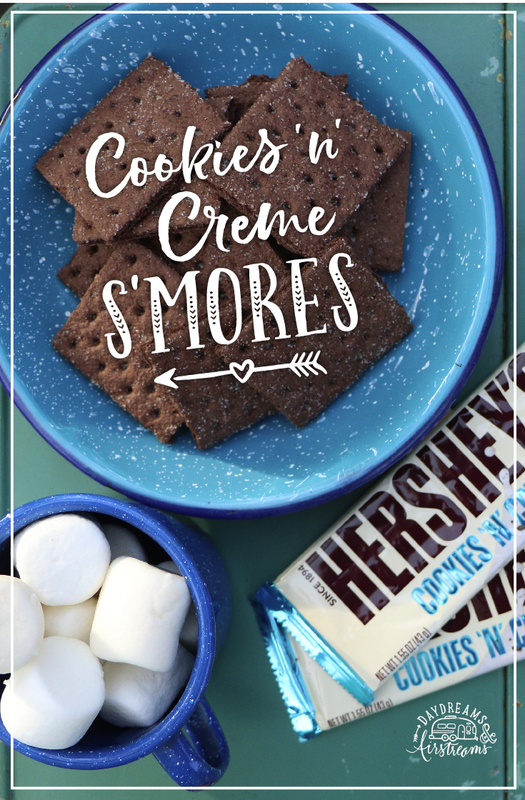 We love a good s'more around here, and we are always looking for unique and fun recipes to try. At the top of our list right now is the Keebler Fudge Stripe s'more. And you can never go wrong with a good old traditional s'more. It's legendary for a reason! But one day while scrolling through Facebook, I saw a post with chocolate graham crackers and Cookies 'n' Creme chocolate bar. I immediately thought, "ohhhh, we HAVE to try that"! On Sunday nights we love to fire up the firepit as a grand finale to the busy weekend. We usually sit with a cold drink and relax. This past weekend we started the firepit (although it was 91 degrees in THE SHADE!). I loaded up all our supplies and headed out. My chocolate bars began melting the minute they hit the warm air, so we had to be quick. We got the marshmallow roasted, and all gave it a taste to see if this would be our new favorite. My opinion = a tad too sweet for me. One thing I love about traditional s'mores is that you can individually control how sweet they are by the amount of chocolate that you put on it. I am a pretty conservative chocolate user. Bryan is one to use a half a bar on one s'more and make the chocolate the main attraction. The Hershey's Cookies 'n' Creme bars are white chocolate and remarkably sweet with crunchy cookie pieces inside. When melted the white chocolate becomes soft, but the cookies pieces don't, giving your s'more a crunchy texture inside. (Reminded me when Darla eats the "crunchy" snowball on the Little Rascals.) I didn't love that, but you just might! The chocolate graham cracker was richer than traditional cinnamon or honey graham. So the combination of the white chocolate, cookies, and chocolate graham cracker made this version super-duper rich. Delicious in small amounts, but a little much for me as a s'more. We took a vote, and I still think our Fudge Stripe s'more is the favorite. I'll have a post on it coming up soon! Have any great s'more suggestions? Let me know in the comments! We are always looking for the next "best s'more ever"!